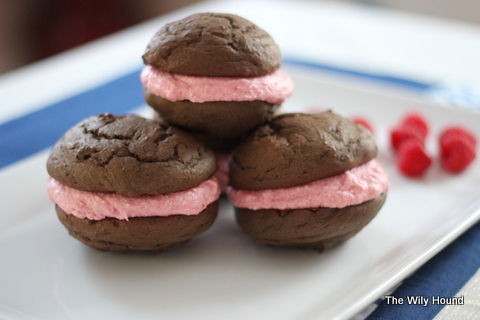 I was tossing around ideas for a Valentine’s Day dessert and had almost settled on chocolate cupcakes with a raspberry frosting when inspiration struck – whoopie pies! My first whoopie pie attempt was during the fall – I tried a pumpkin number with spiced buttercream filling and it flopped. I kind of winged the recipe and it just didn’t fly; the cake part turned out gummy and flavorless and even the delicious frosting couldn’t save them. Though I had every intention of trying to make them again, I never got around to it, so I’ve been itching to try whoopie pies again. And with the way these guys turned out, I’m glad I did. 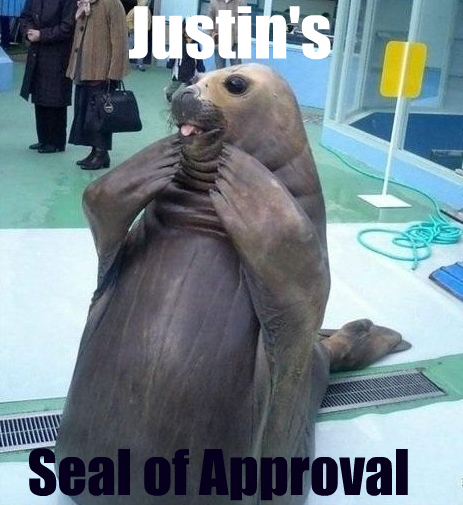 I wish the seal looked even more enthusiastic because Justin really liked these. He spotted the pies when he got home from work (and maybe snuck a bite, though that could have been Brody) and then kept on talking about them throughout dinner, and then he huffed down two of them in the blink of an eye. I’m pretty sure I heard some rustling downstairs last night, so I wouldn’t be surprised if he and Brody had a whoopie pie feast while I was sleeping. But back to the pies. I got the cake recipe from Epicurious and they came out great. 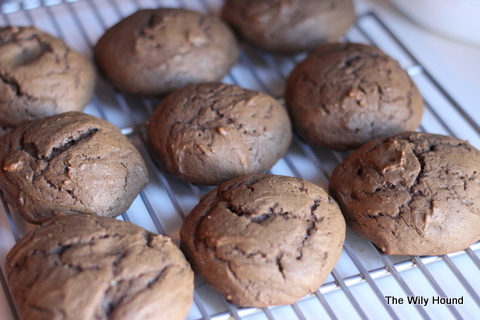 I do think, however, that I picked up the wrong kind of cocoa powder because my pies came out a little lighter (in color, certainly not nutritionally) than your typical whoopie pie. Still delicious, though. As good as the cakes are, the frosting is what really steals the show. 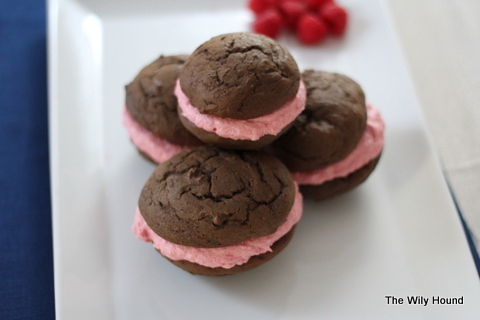 A “raspberry buttercream frosting” Google search led me to a blog called Two Peas & Their Pod. I was nervous that the raspberries would either be unnoticeable or that they would make the frosting too tart, but I was wrong on both counts – it turned out light and sweet and perfectly raspberryific. And when paired with the richness of the chocolate cake, these whoopie pies are decadent enough to make a believer of any “oh, I’m not really a dessert person” loon. Preheat oven to 350°F. Whisk together flour, cocoa, baking soda, and salt in a bowl until combined. Stir together buttermilk and vanilla in a small bowl. Beat together butter and brown sugar in a large bowl with an electric mixer at medium-high speed until pale and fluffy, about 3 minutes in a standing mixer or 5 minutes with a handheld, then add egg, beating until combined well. Reduce speed to low and alternately mix in flour mixture and buttermilk in batches, beginning and ending with flour, scraping down side of bowl occasionally, and mixing until smooth. Spoon 1/4-cup mounds of batter about 2 inches apart onto 2 buttered large baking sheets. Bake in upper and lower thirds of oven, switching position of sheets halfway through baking, until tops are puffed and cakes spring back when touched, 10 to 12 minutes. Transfer with a metal spatula to a rack to cool completely. In a food processor or blender, puree the raspberries. Pour raspberries through a fine sieve into a bowl, pressing on solids, to eliminate the seeds. Place butter, half of the powdered sugar, and raspberry puree into mixing bowl. Beat over low speed until well-blended. Add the other half of the sugar, increase speed to medium. Mix until light and fluffy. Spoon the frosting onto one of the cakes and top with another cake, sandwich-style.